Unlike Study Juice, BrainJuice is actual nootropic juice — yummy, liquidy, berry-y juice. No capsules, no tablets. And, believe it or not, no sugar. Okay, there’s a little bit of sugar, but only 1 g sugar in the form of granulated coconut nectar. So, if you were expecting one of those sneaky, sugar-filled “healthy energy drink alternative” products here, worry no more: BrainJuice is the real deal. BrainJuice is a bona fide healthy energy drink alternative. But how does it do on the nootropic front? Does it actually enhance cognition, enough to warrant that heavy price tag? Or should you get your brain boosts elsewhere? Let’s read the BrainJuice review to find out. Created by Sam Elick, BrainJuice was originally formulated as a healthy alternative to Sam’s “cycle of bad habits,” which included energy drink consumption. BrainJuice relies on cholinergic and dopaminergic acting nootropics to deliver its brain boosting benefits. Remember: BrainJuice isn’t just a supplement. It’s actual juice, which may explain the “superfood” berry extracts and powders. Directions: Drink a shot to turn on your brain and feel uplifted in minutes! Use any time you need a mental or mood boost, or take daily for a cumulative effect. Shake well. Once opened, refrigerate and use within 30 days. Do not use if seal is broken. BrainJuice is exactly what it says it is: juice for the brain. And the ingredients it hires for the job are good. Pretty good. Prettay, prettay, pretty good… but are they great? Let’s find out. Vitamin C – Powerful antioxidant with numerous health benefits; although, all that essentially matters is that vitamin C may help reduce free radical damage across the brain and body. B Vitamins – Vitamins B5, B6, and B12 for better brain chemical status, mood, and cerebral circulation. More on B Vitamins. 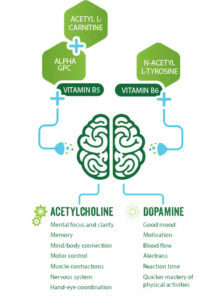 Choline (as Alpha-GPC) – Alpha-GPC supplies a high concentration of brain healthy choline, a precursor compound to neurotransmitter acetylcholine and phospholipid phosphatidylcholine. A solid choice for BrainJuice’s lead nootropic. More on Alpha-GPC. Green Tea Extract – Green tea supplies several awesome antioxidants and brain health compounds, yet BrainJuice seems to primarily use this ingredient for its caffeine content, considering that the non-caffeinated BrainJuice’s single difference is in this ingredient’s caffeine status. (The caffeinated option supplies 75 mg green tea caffeine.) More on Caffeine. Acetyl L-Carnitine – BrainJuice lists ALCAR as an acetylcholine-enhancing ingredient. ALCAR is a hugely popular nootropic ingredient, with significant antioxidant- and energy-enhancing potential; yet, research seems to indicate that the average, healthy user may not get much out of this nootropic. More on ALCAR. Acerola Cherry Extract – A key source of vitamin C, acerola cherry seems to deliver the 80 mg vitamin C listed above. Other than that, it’s hard to tell BrainJuice’s full intentions with this one. 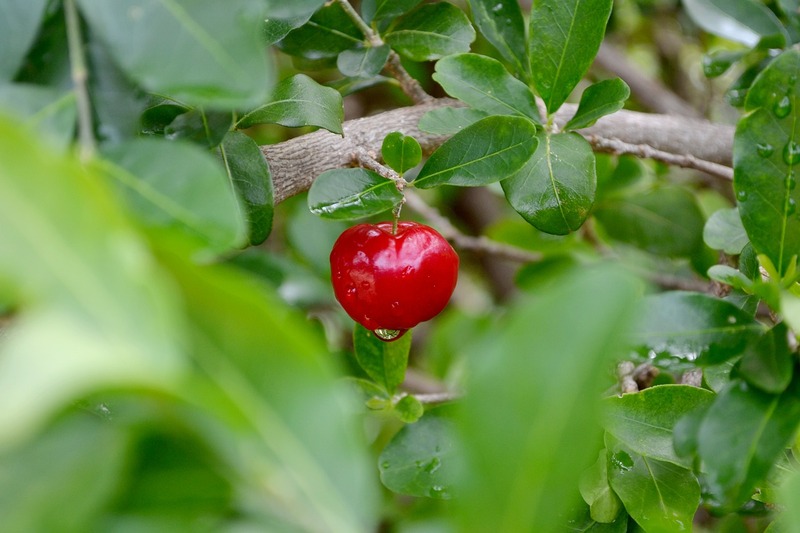 Acerola cherry has the highest natural vitamin C content. N-Acetyl L-Tyrosine – As a catecholamine precursor, L-tyrosine is an awesome anti-stress, pro-motivation nootropic that helps keep the mind motivated and focused during otherwise high-stress, high-activity conditions. N-Acetyl L-Tyrosine is the preferred nootropic form. More on L-Tyrosine. Organic Açaí Berry Powder – Part of BrainJuice’s “superfood” juice appeal, açaí is a trendy, yet healthy antioxidant-rich berry with significant neuroprotective potential. Organic Blueberry Powder – More “superfood” berry juice, blueberries supply neuroprotective, neuroregenerative polyphenols, such as resveratrol and pterostilbene. 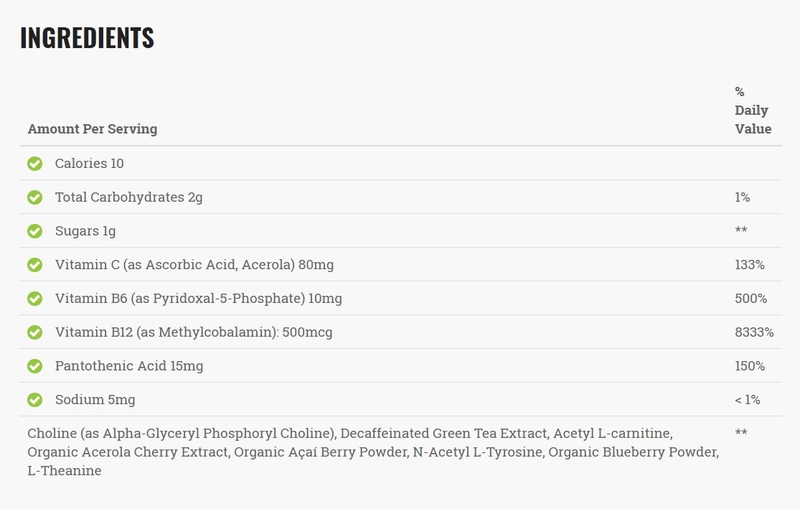 Hard to say the exact value of BrainJuice’s “superfood” berry powders, due to the blend’s proprietary status. But a neat-O addition, nonetheless. More on Pterostilbene. L-Theanine – To offset BrainJuice’s caffeine’s jittery side effects, L-theanine helps keep the mind calm and relaxed without sacrificing any other nootropic’s energy- and focus-enhancing benefits. More on L-Theanine. And for the most part BrainJuice does a decent job at enhancing these brain chemicals. On the acetylcholine side, we have Alpha-GPC and maybe ALCAR. (I say maybe as the research isn’t quite there yet on this guy.) And then for dopamine we have N-Acetyl L-Tyrosine and the B vitamins. And, really, that’s about it. While the remaining ingredients do have their own brain health benefits, they don’t do much for either acetylcholine or dopamine — or at least they don’t do much directly. The L-Theanine + Caffeine combo supports nootropic brain energy, whereas the “superfood” dietary antioxidants add a brain healthy dose of neuroprotection and neuroregeneration. Yet, it’s hard to say exactly how valuable these berry powders and extracts are, given that BrainJuice doesn’t give us much info in the dosage department. Additionally, the nootropic compounds in this stack don’t exactly comprise the most unique formula on the 2018 nootropic market. Many supplements supply choline, tyrosine, theanine, and ALCAR, and they do so at a much, much cheaper price than what BrainJuice charges. Perhaps the price is earned by BrainJuice’s juice status: it’s about what you’d expect from a health drink. Yet, compared to other nootropic supplements, BrainJuice seems overhyped and overpriced — even if the ingredients are great for brain health. As a healthier energy drink alternative, BrainJuice gets the job done. And it gets the job done with only 1 g of sugar. That’s pretty sweet. 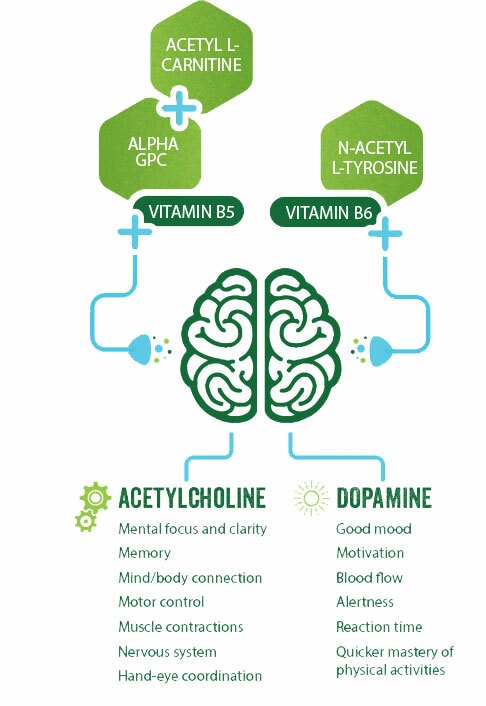 Acetylcholine and Dopamine — the right brain chemicals to target, if you’re targeting better memory, focus, mood, and motivation. Although I don’t know what’s exactly in all of those extracts, BrainJuice’s nootropics are generally high quality and premium-grade. Two options: caffeinated and non-caffeinated. Most “superfood” energy drink alternatives come across as overhyped and overpriced. BrainJuice isn’t much of an exception. Many cheaper nootropic supplements supply these same nootropics — and then some — to potentially greater effect and cognitive results. Both BrainJuice Original and BrainJuice Caffeine Free sell at the same pricing options as listed above (if you buy through the BrainJuice website). On the BrainJuice website, an “original price” of $50 is crossed out next to the $47.88, indicating that what you’re buying here is at a discount… yet, I haven’t seen BrainJuice sold at the “original” $50 price anywhere. Even GNC sells the drinks individually at $3.99, matching that $3.99 per serving. So, ya know… now ya know. BrainJuice seems designed for the guilty energy drink lover, who is looking for a cleaner, green energy drink experience. College students may get a kick out of this bad boy. Ditto for the yoga pants-wearing Whole Foods shoppers. However, veteran nootropic users likely won’t find much here for them. You can buy BrainJuice via the BrainJuice website or other various retailers, such as GNC, Amazon, Vitamin Shoppe, and more. Sure, BrainJuice has an awesome cholinergic nootropic (Alpha GPC), and BrainJuice has an awesome dopaminergic nootropic (N-Acetyl L-Tyrosine). And the antioxidant berry juices and compounds may help enhance the brain’s neuroprotective potential, while the L-theanine + caffeine duo may get the brain pumping right away. BrainJuice works. But does this superfood juice work super good? Maybe? Perhaps there are genuine super-secrets hidden by BrainJuice’s proprietary blend. Yet, my confidence isn’t too high there. Some of the best nootropic supplements today supply these same ingredients — with their dosages disclosed — in 30-day supplies at a much cheaper price per serving. But, hey, BrainJuice isn’t simply a nootropic stack. It’s juice! And it’s a brain-healthy, sugar-free juice; a valuable product for the health conscious energy drink lover. And perhaps that alone is worth the price for you.